In terms of universal conversation starters, "I feel so bloated" has become a common thread of dialogue between friends, family members… heck, even strangers. In fact, I would need more fingers than 10 to count on my hands the number of times I've heard a bloat-related grumble at the gym or bar. What's interesting is the complaint has almost morphed into a kind of currency. After all, almost everyone can relate to the signature ickiness of bloat, and what's more satisfying than banding together in joint condemnation of something that makes us feel collectively crappy? See, this is why our Sunday brunches are rife with talk of exes, crazy co-workers (dear Byrdie team, this is hypothetical! ), and yes, the uncomfortable shape and feeling of our tummies whenever we're feeling the annoying nudge of bloat. Le sigh. What's frustrating, however, is the lack of obvious rhyme or reason on those days when my jeans feel tighter around my waist or when I just feel tired and blah. For instance, I'll go a week eating a relatively clean diet, drinking my water, and doing my Downward-Facing Dogs, and still, my tummy and psyche simultaneously rebel. Then, I'll go on a random streak of pizza and tequila sunrises (with zero Down Dogs), and my body feels practically on cloud nine, no bloat in sight. I'm sorry—come again? That being said, bloat isn't random, and even though it often feels like an evanescent phenomenon impossible to crack in terms of cause and reduction, it does have its reasons for showing up when it does. There's a silver lining, too; it definitely has its kryptonite. 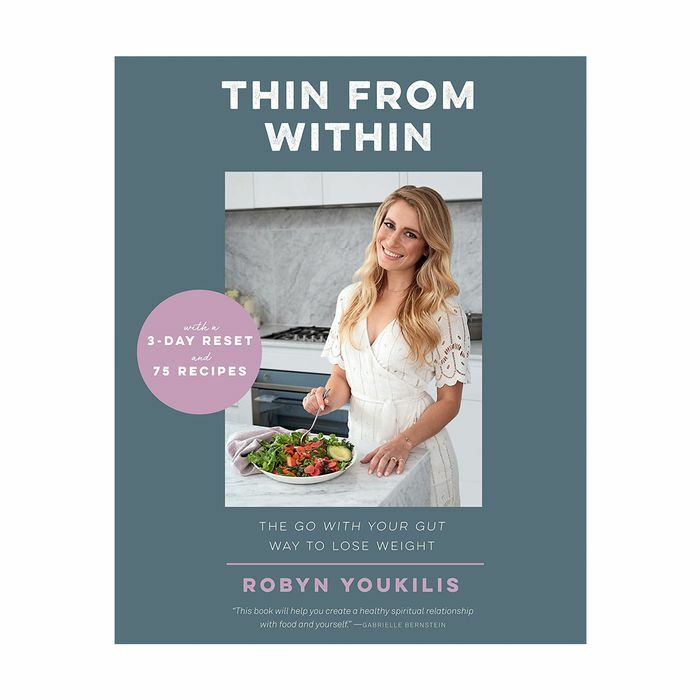 To break bloating down once and for all, I tapped gut expert Robyn Youkilis, who knows a thing or two about caring for and preventing the uncomfortable condition of bloating. Ahead, everything you ever wanted to know, plus, how you can reduce bloating in a healthy and holistic way. Keep reading! According to Youkilis, a leading expert in digestive health and author of Thin From Within, bloating (in the most technical sense) is the swelling or distension of the abdomen. Painful and/or uncomfortable, bloating can last anywhere from 30 minutes to a few hours depending on the unique environment of your gut. Which, as we will talk about it in a minute, is perhaps the most important factor when it comes to why we bloat and how we can reduce it. Sick of hearing about the importance of gut health? Prepare yourself because it's the essence of bloating. As for causes and all-too-common aggravators, Youkilis charges multiple perps including not chewing food thoroughly, consuming foods or food combinations that cause or trap gas in the intestinal tract, and last but not least, more serious, long-term disorders such as irritable bowel syndrome (IBS), inflammatory bowel disease (IBD) and small intestinal bacterial overgrowth (SIBO). Additionally, other sneaky habits like filling up on carbonated beverages (be they sparkling water, champagne, or soda) or consuming too much fiber from indigestible fiber-filled food sources like flaxseeds, sunchokes, and vegetables can irritate the gut, possibly making bloating worse. Ugh. Luckily, Youkilis says there are plenty of tactics that can lend a helping hand so you can have your cake (or should we say champagne?) and eat it too. Keep scrolling for her expert-approved bloating solutions. Help is in sight! And by that, Youkilis means chewing your food until it's essentially a liquid in your mouth. "So many of us are rushing through our meals and skipping an important part of the digestive process—chewing!" Youkilis says. "When you don't chew your food completely, it creates more work for your belly, which can result in uncomfortable bloating, gas, and other digestive symptoms." It's no secret that probiotics have overtaken the wellness world as a potential cure for, well, basically anything. In terms of caring for a perturbed and bloated gut, popping a pill brimming with healthy bacteria might be one of the most strategic things you can do to naturally help your body. "Another way to manage bloat is to focus on nurturing your gut, specifically the millions of bacteria that live in your digestive system (aka your microbiome). These bacteria play a huge role in breaking down your food and assimilating nutrients," explains Youkilis. Even more interesting? No matter how many healthy we're eating in the present, if we're simultaneously struggling with stress, random poor food choices that send our body out of whack, or a history of antibiotics, bloating can creep up regardless—whether or not you had a healthy day of meals. To reduce bloat, Youkilis suggests reaching for a high-quality probiotic supplement (she loves the new All Flora Probiotic from New Chapter) and filling your plate with plenty of fermented foods, which are naturally rife with the same good kinds of bacteria as your probiotic. Think raw sauerkraut, yogurt, kefir, kombucha, and pickles—just make sure they're the kind you get in the refrigerated section of your grocery store, not the shelf stable brands, warns Youkilis. And if you're still curious about the magic surrounding fermented fares, check out both of Youkilis's books, Thin From Within and Go with Your Gut, to serve as your ultimate guide. You'll also want to make sure you're eating enough prebiotic-rich foods (many probiotic supplements also include them in their formulation) as they're what feed the gut-healing probiotics. Similar to probiotics, drinking five million times your weight in water per day is an all-powerful antidote for every health woe, according to models, celebrities, and basically every health expert we talk to. Hydration is important! Yet, as Youkilis told us, you'll want to monitor your sip timing if you're looking to prevent or reduce bloating. Specifically, she says to avoid drinking water during your meals, instead only imbibing a half-hour before and after you eat so as not to dilute your gastric juices, which may negatively impact your body's natural digestion process. However, if you really need to quench your thirst mid-meal, she recommends sticking to something easy on the tummy like hot water with lemon, hot tea, or water served at room temperature. According to Youkilis, opting for a hint of aloe vera if your abdomen feels like it's heading wayward is kind of like cooling an internal sunburn (aka inflammation) occurring inside your gut. She recommends grabbing 100% pure, no sugar added aloe vera juice at the grocery store, fresh aloe (you can scoop the healing gel out yourself! ), or a powdered version of the plant to upgrade your daily water routine. "Digestive enzymes are great to take before a big meal or if you simply feel like your gut could use a little more support," Youkilis shares. "Taking a digestive enzyme will help break up your food (especially if you're eating something you don't usually eat like gluten, dairy, sugar, etc) so your belly doesn't have to work as hard." Ed note: As someone who has struggled with bloating personally, I've found the below digestive enzymes form Hum Nutrition to be immensely helpful! While gut imbalances and lifestyle habits that cause bloating are usually mundane enough to treat with the help of Youkilis's tips and tricks above, she did make clear to me that treatment is totally dependent on the individual, and what works great for some might not work for another. Therefore, experimenting to find out what works for your body's unique needs is paramount. Also, while her tips can alleviate symptoms in most cases of bloating, there are a few more serious digestive conditions and disorders like leaky gut, Crohn's disease, SIBO, and Celiac disease that require specific attention from a physician and a more personalized healing protocol. Therefore, if you think you may have one of these conditions, it's imperative to consult a trusted medical professional before beginning a new health and supplement routine.